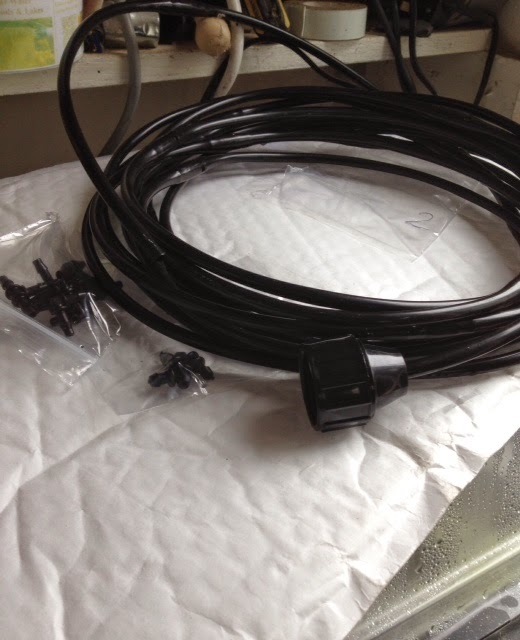 I was recently asked to trial some micro-watering kits in the form of a drip-line from Easy Watering. Now I said yes to this as one problem I have is keeping the greenhouse and outside pots watered when the weather gets warm and dry. The weather has been getting warmer and watering the greenhouse is now something I am doing more regularly. The drip line was duly received. I admit to being a little non-plussed that it did not come with any instructions, but to be honest it is not difficult to work out how to use it. Did it work? I tried it first in the greenhouse as that felt like the priority to me. It did work and actually worked best when used in conjunction with a capillary mat as that helped the water be spread more evenly. I liked it best however when it was working outside in the Courtyard with the various planted up pots. There it worked very well and I could rely on it to just keep them nicely damp but not water-logged. It certainly helps if the pots are damp to start with. It does take a bit of trial and error to get the water to drip at the rate you want, but that was no great hardship. The dripline found its forever home in the Courtyard. So my top tips are: if you want to use it in the greenhouse a capillary mat is a good addition. It works very well from an outside tap with container planting.